Last Drop-In is 12/20 and will start again for the evening Drop-In on 1/5. Kristin Nicholas will be in our parking lot offering frozen lamb from her farm, Leyden Glen Farm on Thursday, 12/22 from 5:30pm-7:30pm. Year End Sale begins online 12/22 and runs through 1/1. In store the sale is 12/26-12/31. 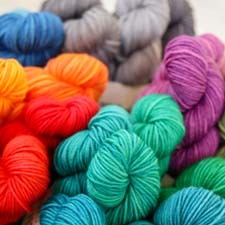 In Store – You’ll find all the yarns that are online, plus small lots of special deals like Nashua Daylily, grab bags similar to what you saw at the Tent Sale, and more! This entry was posted on Saturday, December 17th, 2011 at 9:00 am	and is filed under Ready, Set, Knit Podcast, Sales. You can follow any responses to this entry through the RSS 2.0 feed. You can leave a response, or trackback from your own site.